I have been waiting for this sophomore album since I heard the first Joe Nichols' (self-titled) CD several years ago. Anyone trying to clump him in with the latest herd of hatless/handsome/hunks who have been showing up in Nashville of late, should know that this is one tried and true artist whose youthful appearance belies the fact that he HAS paid his dues. This CD plays across your senses like the sweet smell of honeysuckle on a balmy Tennessee evening. It also plays a broad range of emotions, albeit all of them familiar. The voice is as soothing and comforting as an embrace from an old friend. The twelve songs are an eclectic mix of the best that life has to offer-lyrically and musically. The first song on the album is the chart-busting single, "The Impossible," a beautiful, well-written ode to strength of spirit. This song is followed by an up-tempo tune titled "Joe's Place," that is sure to cause involuntary toe-tappin'. Then comes "Brokenheartsville" - the title alone guarantees that it qualifies as a country music classic and the lyrics only corroborate my opinion - "here's to the past, they can kiss my glass." This catchy ditty is followed up by the cleverly written lyrics and mellower tone of "She Only Smokes When She Drinks." Talk about easy listening. This one is right on. Next comes "Everything's A Thing" - another co-written song by Nichols - a just plain fun tune that will keep running through your head for long after the song ends. As proof of what I just said, the last line of the song goes, "if you think this song ain't worth hummin'... you gotta another think comin'." Trust me; you will be hummin'. "That Would Be Her" is simply beautiful and simply beautifully sung - a love anthem of the highest caliber. Just about mid-sigh from the peddle steel on this tune - here comes another "we are just havin' a ball song." You will be instantly transported to a down-home, feel-good Texas Honky Tonk by the first strains of "Cool To Be A Fool." Another co-written by Nichols, this song clearly demonstrates that some young singers have very old, musical souls. And just when your heart is two-steppin' as happily as if it really were "cool to be a fool," you are blind-sided by the Merlesque depth of a hauntingly beautiful ballad - "Can't Hold A Halo To You" (also co-written by Nichols). Whew! Just an exquisitely written and passionately sung love song. The next three songs - "You Can't Break The Fall," "You Ain't Heard Nuthin' Yet," and "Life Don't Have To Mean Nothin' At All" (written by Tom T. Hall) - continue to rock, reel and enlighten your musical essence. The piano in "You Can't Break The Fall" adds a refreshing and unique feel and when the guitar takes over ... well, there's this rift change that the guitarist does and then Nichols voice does the same. I can't explain it, you are just going to have to hear this one for yourself. Pure perfection! The CD ends with the title cut, "Man With A Memory" which means this CD ends as strongly as it began. 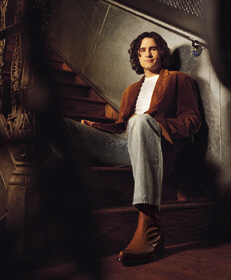 After hearing "The Impossible," Nichols' debut single, Robert K. Oermann of Music Row Magazine predicted that Nichols would be the next country "superstar." Oermann is quoted (in part) in the Music Row magazine as saying, "I stopped breathing and my heart skipped a beat while this masterpiece unfolded." Hearing only one song from Nichols CD left Oermann feeling that way. As I come to the end of the entire album, and the twelve songs that just took me on an incredible, emotional, inspiring, up/down/turn around, knee-slappin', heart tuggin' journey - I am hard-pressed to top Oermann's comments until one word comes to mind: incomparable. He strolled into Nashville back in the late '90's and totally captivated everyone he encountered. His handsome looks were as disarming as the beyond-the-years maturity of his powerfully disarming baritone voice. He arrived at a time when "hat acts" were frowned upon and being cloned at such a rapid pace that you couldn't tell one new artist from the other - with or without the hat. But all similarities ended there. Once he picked up the guitar and started to sing, it was unadulterated magic. You knew this was not just another hat act. All you had to do was look around the venue as he sang. Everyone was mesmerized - Men, women, children, it didn't matter. He captivated an audience like few others have before - or, in my opinion, ever will again. Nichols was a favorite staple of the Wildhorse Saloon show, was on TNN more often than Ralph Emery and his videos were some of the most requested on CMT. But with no previous business experience to draw on, this aspiring singer/song writer made some less than wise career decisions that left him with little control over his entire life - let alone his career. It was a tough introduction into the music business - and for a small-town kid from Arkansas who only wanted to sing - it was a rude awakening and a reality check that has taken him this long to regroup, rebuild and recover from. But he is on track now, and I'm not the least bit hesitant to predict that this is one name that you will be hearing a lot. When you think of the truly unique voices of country music, there are really just a very few that everyone can readily identify instantly upon hearing - Willie, Merle, Waylon - the true balladeers - the old guard of country music. These are artists whose voices are as unique as they are and we have faith in the integrity of their music because they have steadily exhibited a peerless and dynamic plethora of talent. These are the legends; the icons. These are the artists that Nichols says inspired him and as I sat and listened to this new CD, I was trying to think of the last time when someone this young had displayed this kind of talent and maturity in their music. It didn't take long for another legend, Keith Whitley, to come to mind. J-o-e N-i-c-h-o-l-s. Write that down. You don't want to forget this name. You are going to be hearing it a lot. If it were possible to bottle talent, the label would surely list the contents as "Joe Nichols" with a note - not possible to over-dose. On a one to five guitar rating... this one is off the charts!